KIEV, Ukraine -- Just over two years ago, on April 9, 2015, Ukraine's parliament adopted a historic law on opening up the country's Soviet-era secret-police archives. In the new law's first full year in effect, requests for information and access boomed by 138 percent. "It is very important for us that everyone has the chance to look at the complex history of the 20th century through the prism of their own family," says Andriy Kohut, director of the historical archives of Ukraine's SBU security service. "It is one thing when they speak of enormous historical events without any connection to real people. It is something else entirely when you see how these historical events are connected to you." "The law contains the formula 'everything open to everyone,'" he explained in an online interview with RFE/RL's Russian Service. "It doesn't matter if you are a citizen of Ukraine or not, if you are a relative or have some other relationship to those mentioned in the documents. Everyone has an equal right to access." Under the law, the archive is not even allowed to charge for providing copies of its documents. Eventually, the entire archive will be transferred from the SBU to the Ukrainian Institute of National Memory. There are no exemptions for privacy or other such considerations. The law prioritizes "the right of society to know what happened under the totalitarian regime," Kohut says. Access to documents also cannot be restricted based on Soviet secrecy classifications. "It is simply a pleasure to work in the Ukrainian archives," says Czech historian Stepan Cernousek. "While in Russia everything is 'top secret,' in Ukraine, everything is freely available." "Documents weren't always saved in their entirety through World War II [when Ukraine was occupied by Nazi Germany]," Kohut says. "Moreover, after the democratic opposition captured the Stasi archives [in East Germany], the KGB in 1990 ordered a purging of some records." The new openness law also covers all denunciations written by ordinary citizens and preserved in the KGB's files. 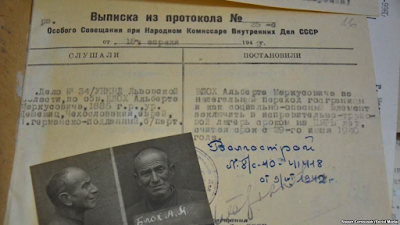 It particularly states that privacy laws do not apply to anyone who participated in political repressions in any way. "This is not very pleasant news for those who wrote denunciations," Kohut says. "But if we don't open these closets with skeletons in them, if we do not speak about the complex history of Ukraine in the 20th century, then it will speak for us. As our current situation shows, it won't just speak for us, it will manipulate us." The archives also contain a wealth of records relating to the Holodomor, the 1932-33 famine in Ukraine that killed millions. These documents, Kohut said, can be upsetting to read. "There are many cases related to charges of cannibalism," he says. "Of course, these documents are shocking." "These are the archives of the communist special services," he adds. "Very often, what they did does not make very pleasant reading." In addition to responding to research requests from citizens, Kohut's archive also responds to inquiries from state agencies pertaining to a 2014 lustration law that bars former KGB employees from working in state institutions. The archive carries out background checks and reports on perspective employees. "The development of our region – Ukraine, Belarus, the Baltic states – shows that we are moving in the direction of acknowledging the communist regime for what it really was – a criminal regime," Kohut says. "It acted in a criminal manner and it was fundamentally criminal. I hope Russia will come to this awareness as well."